Copyright and Version Info (for distribution, like described in Copyright for exported apps). 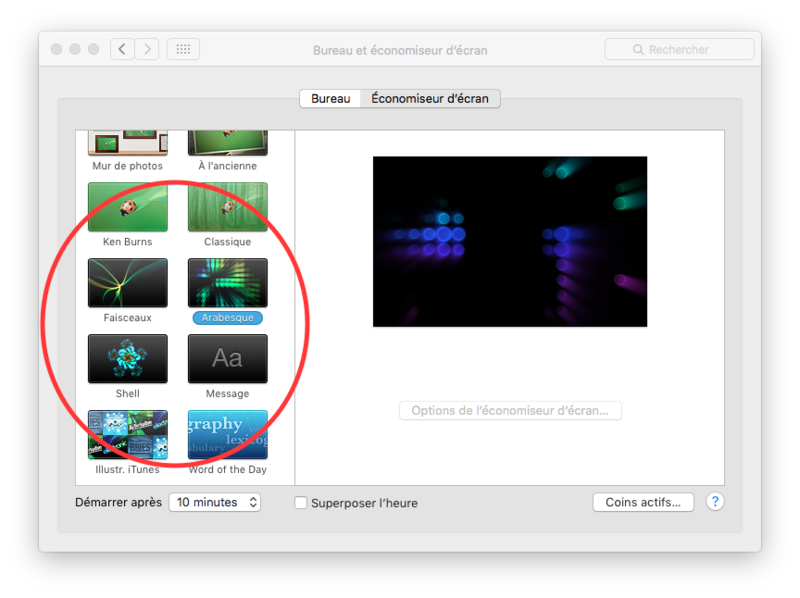 To be able to set an icon / image for the OS X System Preferences Screensaver Gallery (screenshot below). Hope there will be a live preview of the screensaver within System Preferences (or allow us to set a still image as preview at least). The ability for stuff (images, videos, fonts ...) to be bundled within the .saver bundle just like Vuo already allows it for exported apps. I guess people visit my website pretty much for the "iOS Screensaver for Mac" only. Created years ago and not updated for years, I just took a look at my Weebly website stats and was pretty impressed. 475 unique visitors a week at this date, 877 page views. Pretty good for that old guy. It had much articles featured in OSX online magazines, 200.000 downloads, but still I'm impressed after all those months. So I think it has some Vuo potential. This feature became pretty quick to implement once the structure was in place for Deploy compositions as FxPlug plugins, and it has a lot of votes, so we plan to include it in the next major release. Is there a way to access the votes that choose FR's got before becoming 'Chosen', Jaymie ? Just curious what the threshold tends to be for non-trivial FRs. 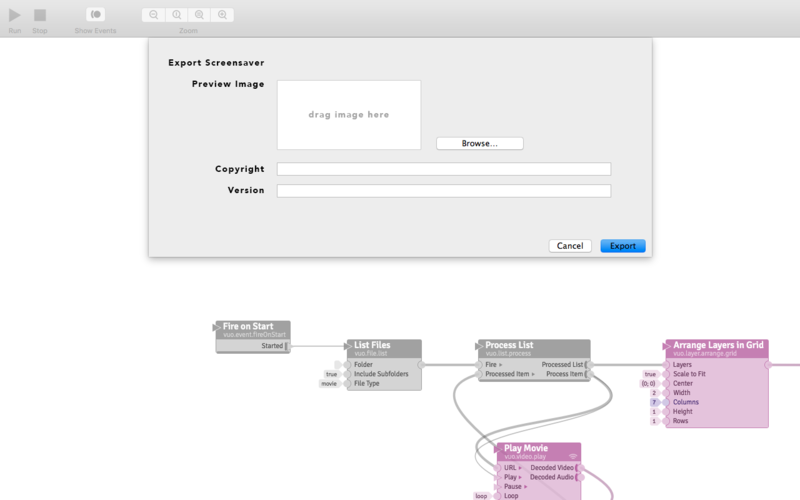 Slightly OT, happy to move to a new thread, but for my Screensaver I need to be able to startup an AppleScript that gets current song and next song info from iTunes… I can do it in QC can I do this in Vuo in anyway with an exported screensaver? I think QC screensavers don't work with macOS anymore do they? Amazing Jaymie ! 1.3 is is going to be huge ! • The ability for stuff (images, videos, fonts ...) to be bundled within the .saver bundle just like Vuo already allows it for exported apps. While I expect some limitations for the screensaver feature (mouse interaction make no sense for example) I really hope they will tend to the maximum possibilities like exported apps for example can (sound interaction, bundle within saver possibilities etc). If we can bundle stuff within it (fonts, texts, files aka also Applescripts) maybe Vuo could open your Applescript using the "open app" Vuo feature and your Script could maybe save a .txt file that you would have to check every x-seconds with your Vuo Composition/Screensaver. If it's for yourself, no problem, but if it's for sharing, your Applescript apps needs to be code signed to open on other user's computers if I'm right. Thx Bodysoulspirit yeah codes signing, sigh.